The timing for his adventures could not have been better, his first trek was in the late 70s. Japan was just starting to break into a economic boom. Japan and the Japanese countryside was rapidly transforming and many small towns were being abandoned. People were heading for the cities to seek there fortunes and the small country towns were forgotten. Booth visited many of these places on his travels and showed us (the reader) how wonderful or sometimes weird and funny Japanese country people are. His second journey was 10 years later in the 80s and the changing Japanese countryside is evident in his writing. Japan is not the same Japan from 30 years ago. It’s a shame because the Japan from 30 years ago is the place I would like to live in. Some people believe Booth did not really like Japan and sometimes in his writing you can see his disappointment and frustrations with the country, however I do understand these feelings. I lived in Japan for 6 years and for the most part I loved it. Of course there were times I did not like it and I think it is the same for most people where ever they live. Unfortunately Alan died young back in 1993. ONE OF the favourite watering- holes of the writer Alan Booth was a very small, country-style bar in the suburbs of Tokyo named after the Japanese ‘wandering poet’ Ishikawa Takuboku, who died of tuberculosis in 1912 at the age of 26. Booth liked the place for several reasons: it was close to where he lived, he was on friendly terms with the masta of the shop and the beer was not served from small glasses, as usual in Japan, but from half-pint pewter tankards stamped ‘Made in England’. It was to Takuboku-tei that Alan Booth might turn after a hard day’s writing – a bristling film review for the Asahi Evening News, or an account of his epic walk from the tip to toe of Japan, a journey which cost him several toenails, and which eventually became a classic travel book on Japan, The Roads to Sata (1986). At that time, Booth was only in his mid-thirties, but he was almost an old Japan hand. He moved there in 1970, following a brief spell working in theatre in England. Before that he had studied theatre and English literature at Birmingham University and produced a prize-winning Hamlet. In his early years in Japan, Booth studied Japanese theatre, particularly the classic Noh drama which was developed in the 15th century. While learning the art of Noh-style drumming, he was also gradually finding his true vocation as a writer. He wrote for local English-language publications, taught English at Waseda University and worked for the Japanese broadcasting company NHK, scripting English-language television documentaries. He also learnt how to speak fluent Japanese and sing old Japanese folk songs, a skill which gained him great respect from the Japanese. 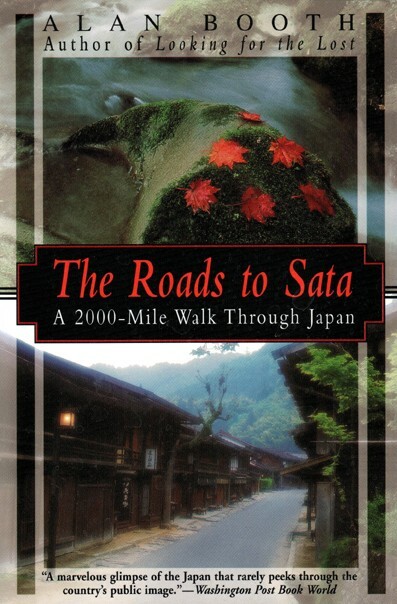 After the success of The Roads to Sata, Booth made more epic walks in Japan, one of which retraced the last journey of Saigo Takamori, the Meiji leader who came to a tragic end making a last stand at Kagoshima in the southern island of Kyushu. Saigo characterised the spirit of the Kyushu man: bold, brave, decisive and honourable; qualities which also applied to Alan Booth. Both were physically powerful men with strong voices and both died in their forties. Booth’s last book, Tsugaru, inspired by a gloomy book written nearly 50 years ago by Dazai Osamu, deals with his travels in the far north of Honshu. Booth’s manuscript was translated into Japanese, serialised in a leading weekly magazine and published as a book in 1992. The original English version is yet to be published. Other books of Booth’s journeys have been published in both English and Japanese, as well as articles, many of which were commissioned by Winds, the inflight magazine of Japan Airlines. Although Alan Booth was a city person – having been born and brought up in London and spending most of his working life in Tokyo – one of his main strengths as a writer was his ability to capture the anecdotes and atmosphere of present-day rural Japan, a world of farmers and fishermen, shopkeepers and school children, festivals and funerals. Booth’s skill was to be able to walk into a small inn or restaurant in a remote corner of Japan where at first he would be greeted with considerable suspicion, but would end up entertaining the assembled company with folk-songs that even the Japanese did not know and listening to the life-story of the innkeeper’s wife. This was a world far removed from the slick city life and corporate comforts of urban Japan. With sharp wit he criticised Japan’s manic modernity and his sympathies always lay with people whose houses were pulled down to make way for new motorways. Into the blue sky smoke fading . . .
sadly, emptily, smoke fading . . . Unfortunately Booth died in 1993, I would have liked to meet him. I first came across the name Alan Booth when I was reading the work of another travel writer, Will Ferguson. In Hokkaido Highway Blues, Ferguson hitchhikes from the south of Japan to the north, a journey I learned Booth had taken in reverse earlier in the The Roads to Sata. The difference was that where Ferguson had hitchhiked, Booth had done the journey on foot—from the most extreme point north, Cape Soya, to the most southerly point, Sata: a distance of over 2000 miles. It was a bit like discovering a good album, then tracing the artist’s own musical influences: a trail which often leads to the unearthing of gems—such was the case with Alan Booth. Booth has been described by Ian Buruma as “Not only one of the finest travel writers on Japan, but one of the best travel writers in the English language.” Good travel writers are prepared to go that little bit further, to dig deeper and discover more about the country that they are traveling in. The way Booth traveled and his intent as a writer were inseparable: traveling on foot allowed him access to the places that the expressways and shinkansen missed, places which he brought to life with a mix of anecdote, observation and historical/cultural background. The Japan of this time still has one foot in the past, though, and not everybody has evacuated the countryside to live in the cities. Life in the more remote regions remains as it has for generations. People still talk of distances in terms of ‘ri’ instead of kilometers, and real traditional festivals are carried out away from the flash of the tourist cameras. In one chapter, Booth describes an O-bon festival in Yamagata where the entire village heads to the local graveyard to welcome back the dead by candlelight. On another occasion, he is invited to participate in the Namahage festival in Akita, where locals dressed as devils go door to door terrorizing children. At the culmination of the festival Booth is asked to lead the communal prayer and perform a Shinto ritual. Unfortunately, the sake gets the better of him and in a typical Booth moment, he messes it up. Not that anyone seems to mind, given that the entire village seems to be as drunk as he is. Descriptions of encounters with the people he meets show a comic sensibility, sometimes used to expose pretentiousness, but often, it is simply a means of highlighting the gentle absurdity of the world he saw around him. In the extract below, a ryokan owner takes Booth to the local school where he teaches. A battered metal globe had been dragged out to the front of the class and the four children clustered around it, wriggling. “No Kazuko-chan, that’s Saudi-Arabia. This is England,” said Mr. Obata, tapping Iceland. 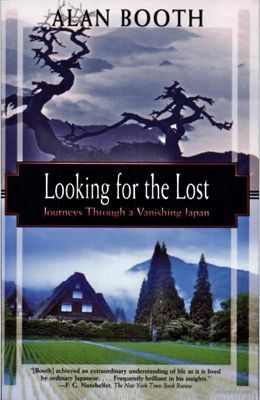 Booth’s second and last book, Looking for the Lost, is based on a series of journeys undertaken more than a decade after Sata. In late-eighties Japan, he sees the result of the changes underway in the first book. The construction industry has been busy paving, damming and building roads through even the more remote regions; the migration to the big cities has left some of the rural areas looking like ghost towns; and children no longer follow him around yelling English phrases. The journeys are temporal as well as spatial and Booth takes us back in time, following routes taken by famous Japanese. We learn about present day Japan in the way it reinterprets its past and reconstructs its heroes. He searches for the ancestors of the tragic Heike clan, follows the final march of ‘Last Samurai’ Saigo Takamori, and traces a journey home to Aomori by the writer Dazai Osamu, who turns out to be one of Booth’s least favorite subjects. The angst-ridden Dazai, from a wealthy background, is compared unfavorably to the blind Tsugaru shamisen player, Takahashi Chikuzan, from the same area. Booth’s respect for Takahashi Chikuzan and appreciation of his music was consistent with the version of Japan that Booth, who grew up in the working class area of London’s East End, came to love. An actor and theatre director, he originally came to study Noh, but found it detached from the country he found himself in. Instead he was drawn to more earthy forms of local culture like festivals and folk music. His was not the Japan that other Western writers of the time swooned over—of Noh, Tea Ceremony and Zen. Booth’s Japan was more that of common people, of the countryside (especially the north), and of Shinto more than Buddhism. On the last page of Looking for the Lost, Booth describes a “niggling in the stomach” that turned out to be a symptom of the colon cancer that led to the writer’s death in 1993, at the age of only 47. During his illness Booth continued to write a column for the Asahi newspaper, recounting his experiences as a patient with the same sense of humor that characterized his travel books. His former editor and friend, Tim Harris, describes Booth as a “witty, highly intelligent, passionate man” with an ability to “see things with a freshness” that anybody who has read the books would understand. The Roads to Sata and Looking for the Lost still make most people’s top ten list of the best travel books written about Japan. They are published by Kodansha International and are still available in most major bookstores. Previous Post Tokyo Ginza revisited.